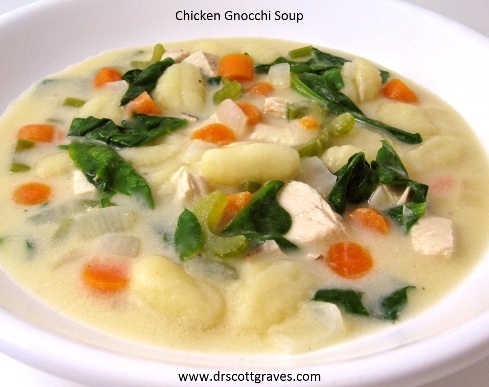 Do you love the Olive Garden Chicken Gnocchi Soup Recipe? Well, you can make this soup in your home that is healthier than the soup that they make at Olive Garden. Gnocchi is typically made from potato (or sweet potato), wheat flour and egg. It can be made with coconut flour instead, which is a healthier option than wheat. You can make your own gnocchi from scratch. Otherwise, I would suggest buying it organically to avoid GMO’s and pesticides. Other ingredients that are changed in this soup are related to dairy as well. In place of the butter, you can use coconut oil. In place of regular flour use coconut flour and instead of half and half use organic coconut milk. I thought it would have a more coconut flavor, given all the exchanges for coconut, but I was very pleasantly surprised that is tasted very similar to the soup they have in Olive Garden and didn’t have a coconut flavor to it. All other ingredients are suggested to be organic and grass fed products. Melt the coconut oil into in a large saucepan over medium heat. Add the onion, celery, and garlic and cook, stirring occasionally until the onion becomes translucent. Whisk in the flour and cook for about 1 minute. Whisk in the coconut milk. Simmer until thickened. Whisk in the chicken broth. Simmer until thickened again. Stir in 1/2 teaspoon salt, the thyme, parsley, nutmeg (if using), carrots, spinach, chicken, and gnocchi. Simmer until the soup is heated through. Before serving, season with additional salt, if necessary.